At Hotel Pension Onganga, a hospitality establishment in Windhoek, Namibia, you'll find that personal service and top notch facilities that do not have to cost the world. With 10 well-appointed, spacious rooms, bar/restaurant and swimming pool, establishment has become a popular domicile for quality conscious business travellers and tourists alike. All 10 luxuriously appointed rooms (single, double, twin) have en-suite bathrooms, TV, telephone, roof ventilation, wall heater, a kettle for tea and coffee and a fridge. Hosts provide a clean and comfortable environment for you to work or relax in - at very competitive rates. A generous and healthy buffet breakfast is served every morning. To keep you in touch with the rest of the world, international phone, fax and e-mail facilities are available. Pension's pool under the warm African sun is the ideal place to relax. Enjoy a stunning view onto the Auas mountain range from the bar - the perfect place for a sundowner. 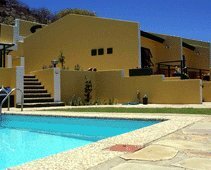 Hosts also serve dinner and gladly assist you in making your travel and further accommodation arrangements in Namibia. A shuttle service to and from Hosea Kutako International Airport as well as interesting tours for up to six persons can be arranged.